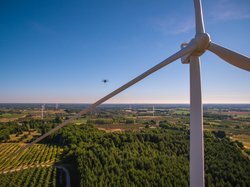 SkySpecs, the award-winning provider of robotic solutions for the wind energy industry, today announces that they've officially inspected and analyzed over 33,000 wind turbine blades with their fully automated drone solution. The company's onshore and offshore inspections span the globe, and their newly-released software solution, Horizon, enables customers to analyze inspection data and manage their fleet maintenance. "Because our inspection process is extremely measurable and repeatable, SkySpecs is able to observe the same damages and draw correlations from year to year. We're able to tell you whether damage has changed in size or if severity has gotten worse, and whether repair has become more urgent. We're starting to see owners use this data to develop more predictive repair strategies," said SkySpecs CTO Tom Brady. Inspected both the largest operational wind turbine and the largest installed wind turbine in the world in collaboration with Ørsted. "SkySpecs is the only drone inspection company in the world operating at this scale," says Ben Marchionna, SkySpecs' Director of Global Operations. "Our proprietary automation software and customized drone solution enable our global inspection teams to work faster and safer, and gather data more reliably and repeatably than any other solution on the market today." SkySpecs currently offers an end-to-end blade inspection and software solution that enables wind farm professionals to collect, manage, and analyze their blade data with ease. Their core technology lies in the flight automation software on the drone and Horizon, cloud-based data analytics, management, and planning software. SkySpecs will be exhibiting at the WindEurope conference 25-28 September 2018.